A body pillow is the answer! The right body pillow can eliminate pressure point pain, keep you from tossing and turning, and ultimately help you get a better night’s sleep. It can be difficult to differentiate one body pillow from another, but there are key differences that are often overlooked. Many great options are offered at a reasonable price, and can be a game changer for anyone with sleep issues. Below, we’ve hand-selected five of the best body pillows on the market. Read the reviews, then pick one up. Your future, well-rested self will thank you. Just as the name infers, this snuggly memory foam option is so soft and squishy, you may never want to leave your bed. Thousands of reviewers love that the pillow never goes flat, and rave about the supportive orthopedic shape. One perk worth mentioning is the pillow’s ability to conform based on your preferred sleep position. It’s hypoallergenic, dust-mite resistant, and eco-friendly. It even comes with a breathable, cooling cover for additional nighttime comfort. Bonus: Snuggle-Pedic is positive you’ll love their pillow, but if for some reason you don’t, they offer a 120-night, no-hassle money-back guarantee. In addition, the pillow has an astounding 20-year warranty. This super-soft option was designed with comfort and premium support in mind. The pillow naturally conforms to the body as your snooze, and the ball fiber filling is ideal for supporting the shoulders, abdomen, hips, and back. Side-sleepers enjoy tucking the pillow between their knees for additional lumbar support. Tend to be hard on your pillows? No problem. The Utopia is double-stitched for longevity, and can be tossed into the washing machine and dryer for easy care. Bonus: The pillow comes with a luxurious cotton cover. Utopia takes great pride in only using premium materials in its products. If you’re in the market for down-like softness without the sneezes and fuss, we highly recommend Pinzon’s hypoallergenic down alternative body pillow. This option is overfilled for supreme squishiness while still offering plenty of support. The natural contours make it an ideal pick for side-sleepers. Plus, the cotton cover and polyester fill make the pillow perfectly breathable. The best part? It couldn’t be any easier to care for. Simply toss it in the washer and it will come out as good as new. Bonus: The pillow has been thoroughly tested and is environmentally friendly. As an added bonus, the pillow is much more affordable than pricier down pillow options. This innovative gel fiber body pillow is the perfect blend of plushness and support. And just like the creators say, this expertly-crafted option “puts all other standard pillows to shame.” Whether you’re pregnant or simply prefer to sleep on your stomach or side, the Zen Bamboo pillow provides just the right amount of support for the back, legs, and arms. 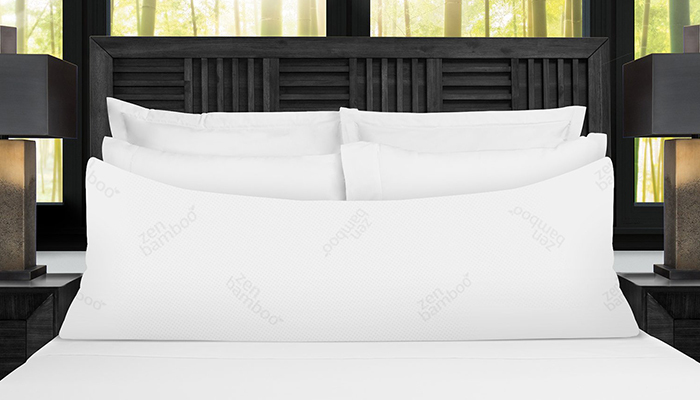 To top it all off, the jacquard bamboo cover is super-soft and breathable for comfort all night long, and the pillow is machine washable. Bonus: Zen is just as dedicated to customer satisfaction as it is to delivering top-of-the-line products. The pillow is surprisingly affordable, and the company offers a 30-day satisfaction guarantee. If you struggle with asthma or allergies, you’ve come to the right place. This huggable pillow includes an allergen barrier to block out microscopic particles allergy-sufferers may be unaware of. Along with promoting a comfy night’s sleep, the Aller-Ease provides support to the hips, back, neck, and abdomen. Plus, it comes with a breathable 100% cotton cover. Bonus: Aller-Ease thought of everything when creating this top-rated pillow. Not only is it priced reasonably; it can be machine washed and dried. Snuggling up to the best body pillow might seem like the ultimate luxury. In addition to comfort, your new cuddle buddy is working behind the scenes. Promotes Falling Asleep: It can be incredibly difficult to fall into slumber if you can’t achieve a comfy position. Pick a body pillow that conforms to your body, and try out new positions until you drift off to dreamland. Next time you crawl into bed and snuggle up to your pillow, your body will know it’s time for rest. Natural Pain Relief: Aches and pains from a medical condition can make it virtually impossible to doze. A body pillow can relieve these twinges by offering customizable comfort and support, and taking unnecessary strain off your pressure points. Relieves Restlessness: If you toss and turn at night, you’re probably in desperate need of a body pillow. Rather than fighting to find the perfect sleep position, your body will have no reason to flail around in search of the ideal snooze. Promotes Proper Alignment: People with back pain or discomfort are often encouraged to sleep with a body pillow to ensure good alignment. Less twisting and turning might just lead to more comfortable rest. Allows Muscles to Relax: Cuddling up to a body pillow allows muscles to relax, which results in improved blood circulation and decreased strain. Can Reduce Snoring: In some cases, body pillows have been linked to decreased snoring, since the pillow makes it difficult to roll onto the back. Pregnancy Support: Pregnant women often fall in love with their body pillow thanks to its ability to offer phenomenal support, making sleep more comfortable. If you don’t struggle to fall or stay asleep, and have no aches and pains, a body pillow can help keep it that way. Regardless of your sleep needs, the right pillow will enhance your sleep experience.